People tripped, fell and were trampled on in the rush to get in line at the U.S. Mint in Denver on 7th August. 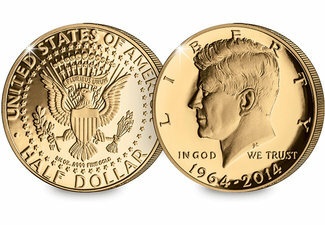 They were all after one coin – the John F. Kennedy 50th Anniversary Gold Half Dollar. After the official launch at the ANA World Money Fair in Chicago, thousands of collectors queued up at U.S. Mint locations each day in the hope of securing one of the 500 coins due to be released daily, with most selling out in just a few hours. Why did this coin cause such a frenzy? Issued to mark the 50th anniversary of the first Kennedy half dollar, it is the first ever US half dollar to be issued in 24 Carat gold. The reverse design also features a ring of 50 stars – more than any other US coin produced for circulation. In fact, dealers were so keen to get hold of the first release coins they were buying the coin straight back off members of the public and some were even offering people $600 to queue and buy the coin for them. The Westminster Collection managed to beat the rush and reserve a limited number of 2014 Anniversary JFK Gold Proof Half Dollars.